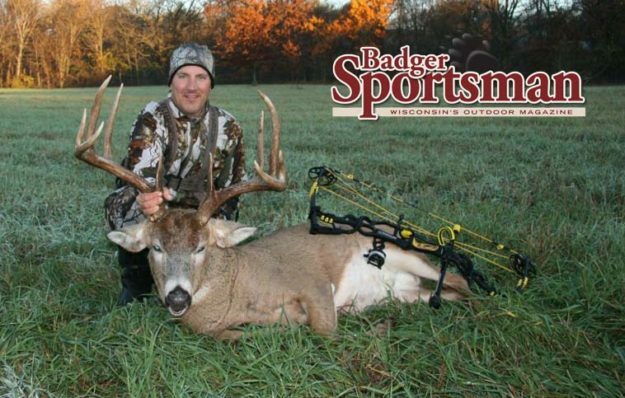 Todd Becker from Linn County, Iowa killed a giant buck on November 3rd after watching the Cubs win the world series in a late night the night before. Be sure to read this incredible story he told on an incredible deer! So this is the story of the November 3rd 2016 hunt. The Cedar River in Linn County has been flooded out all summer. So the deer are pushed out of the river bottom timber and islands on the river on our hunting ground. So we only had a few stands to hunt on the higher ground. I had only been out three times before this hunt on Wednesday. On Mondaynight we had a very nice deer hit the camera. One of my buddies went Tuesday morning and did not see Mr Big. My only chance to hunt was on Wednesday morning! Trust me it was tough getting up after that long Cubbie WS Championship! I headed out to the stand at 6 am. Twice forgetting stuff! First time flash light and second time my phone!!!!!! Overtired! On the way to the stand a sign from Harry Carry came falling down from the sky! As I see the falling star on the way to the stand I wished for Mr Big to show up and take my arrow!!! A Championship Buck after the Cubbies finally win the World Series! I get to our lower 50 acre field to a double ladder stand in a big oak tree. The morning is perfect! North East wind about 5 mph and an aerie fog over the cut field. There is a huge scrape 15 yards from the stand so I set up my buck decoy about another 10 yards from the scrape facing the stand. The set was perfect. Little fresh 2016 Golden Estrus and this boy was ready to battle! I settle into the stand and get all my toys ready. Rattling horns, bleat can and grunt call! Ready to rock! Right at daybreak I see some movement behind me coming up the fence line. I slowly stand up and grab my bow. By this time I can tell he is a monster deer! We are guessing he was close to 275 pounds on the hoof! I take a draw on him as he gets to the decoy! All he had to do was step in front of the decoy and I had an easy 15 yard chip shot into his vitals! Instead he goes behind the decoy strolling like he could give two cents about kicking this plastic deers rear end! I then have to draw down on him. My heart at this time is pounding through my camo! He then strolls with no care in the world about twenty yards past the decoy and stops! As he stops I draw! As soon as I am at full draw he turns his head completely backwards to look at the darn decoy! Two things happen now that I almost pass out! The first is that I get a pretty good look at his rack and I about had an accident. The second is I did not have a good shot at his vitals with his monstrous head turned backwards! So now I am at full draw with the Buck of a life time at 25 yards waiting for him to turn his head back so I can take The Shot! What took maybe 30 seconds seemed like three hours for him to turn back!!! As he did I hit the release and the Gold Tip arrow with a two blade rage broad-head whacked into his side and the lighted knock went off like a firework on the 4th of July! I watched him race into the field like Usain Bolt then pile up at about 200 yards from the stand! It is still dark enough and foggy that I cannot get a good look on him through my binoculars to make sure he is dead so I decide to wait and not chance pushing him up if he is not dead. I am literally shaking in the stand!! Then all of a sudden another buck comes to the decoy!!!!! I could not believe it. He is a decent 8 pointer and he looks like he wants to kick Big Plastics! After circling a few times I think he finally figured out the Mr Plastic was no one he wanted to mess with! So by now the light is good and I can see that the deer I shot is down and not getting up! I get down from my stand and decide to video the setting of the hunt and the walk to The Buck! As I get close to him I start shaking as I see the rack! Then as I get up on him I break down and start to cry like a baby from the 20 years of emotional ups and downs of bow hunting, knowing that I just shot a Buck of a Lifetime! My Dad who was an outfitter in Colorado for over 35 years before he passed in 2005 of prostate cancer always said to me hunting is never about the animal you take but about the experience of the hunt. Well this experience of the hunt ranks up to one of top hunts I will aways remember! My good friend and Taxidermist Jim Kindig gross green scored him at 179 3/8. A true Iowa Buck of a Lifetime!